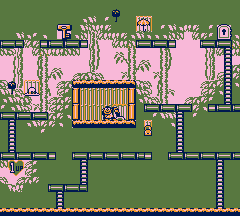 Stage 4-7 is the seventh level of the Jungle in the Game Boy version of Donkey Kong. Mario starts off on the flat ground with a Sairesu on the right. There is a 1 UP Heart below the platform on the left with a Sairesu on it which can be reached with a Handstand Jump. Mario must climb up two ladders then head right to get over to a ladder he must climb. Alternatively, Mario can go left where a Sairesu is found, which he can jump over to reach another ladder, which leads up to a Hammer that can be used to defeat the Sairesu. If Donkey Kong Jr. has the bridge deactivated with the switch then Mario has to jump over the gap which will wake up the Sairesu that will charge at him so he has to be quick about climbing the ladder. Once up to the higher platform Mario must jump once Donkey Kong Jr. has activated the bridge so the Sairesu hears him, wakes up and charges at him while the bridge is still activated, which Mario must Handstand Jump over to get over the Sairesu to get to the ladder and climb it. Once at the top Mario has to go left, he can get to the first platform with and without the bridge but the second one is too far so he must wait for Donkey Kong Jr. to pull the lever to the right side (while watching out for Donkey Kong Jr.'s fake-outs where he goes over to the lever and looks like he's gonna pull it but just dances around it) before he can get across. Mario can grab a Hammer to defeat the Sairesu so it's not in his way, then he must grab the key then go back quickly as Donkey Kong Jr. can pull the lever again to prevent Mario from getting across until Donkey Kong Jr. pulls it again causing Mario to waste time. Once across, Mario must go over to the door with the key to end the level. Hat: Next to the Hammer. Parasol: On the platform to the left of the platform with the door. Bag: Above the platform which the bridge will connect to. This page was last edited on December 9, 2018, at 07:22.